I’ve been in total vacation mode lately. I can’t stop thinking about things I’d like to take on my trip, and pieces that inspire my vacation-style. This ombre-skirt caught my eye a few weeks ago and I immediately thought it would be adorable for our upcoming Mexico getaway. Light & flawy pieces are always ones I gravitate to for my vacation & summer style, but I especially adore this skirt because of it’s ombre-effect colouring. It’s completely unique, and exceptionally pretty. This skirt is perfect for a tropical vacation! I'm so glad you paired this with the leather jacket. It's the perfect mix! This skirt is so beautiful. I like it very much. hehe thanks! I am so excited! WOW. Love everything about this outfit, the leather jacket but short sleeves and the ombre skirt. I want that skirt so bad. Wow such a nice outfit! love it all! you have such a nice glow to you – i really love these pictures!! 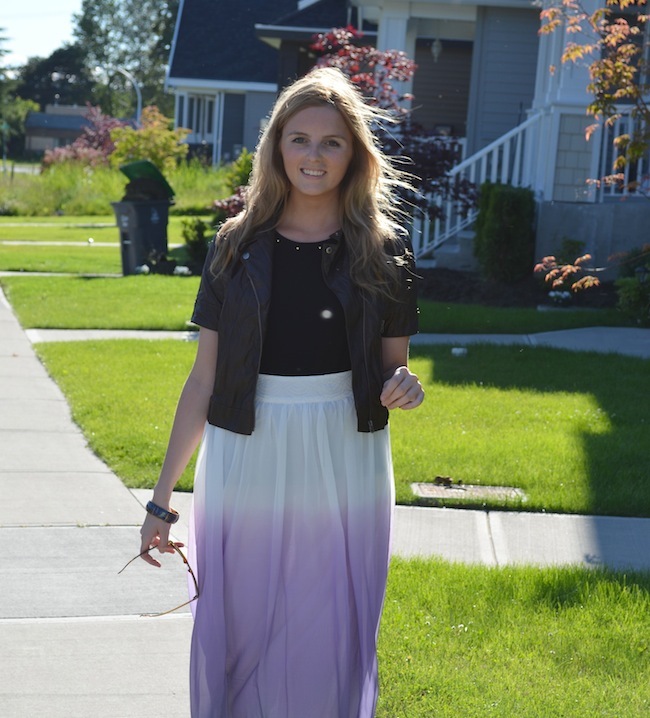 That skirt is so much fun and perfect for the summer! I know you'll get a ton of wear out of it with all the fabulous sunny weather we're having! It is really summery, I am totally loving it! I LOOOOVE this skirt! It is so gorgeous and you styled it perfectly! Great skirt, you're right, this will be great for Mexico. How fun! Wow, wow, wow! This skirt is gorgeous and SO you! I think you'd love one of my upcycled skirts https://www.etsy.com/listing/124672394/sale-bohemian-skirt-dip-dye-ombre. It's a little shorter, but ombre dip dyed in lilac as well, finished with a nice feather transfer and vintage braid. And oh my that jacket, I want it, I want it!